Were you wondering? I won't bore anyone with details of my absence. There really isn't any great reason. 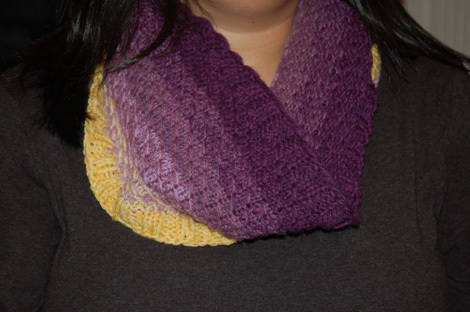 I did finish the Dipped Infinity Scarf though! This is a fantastic pattern. Easy to memorize and customize with any colors. I did cut one color out because it was plenty wide as it was. 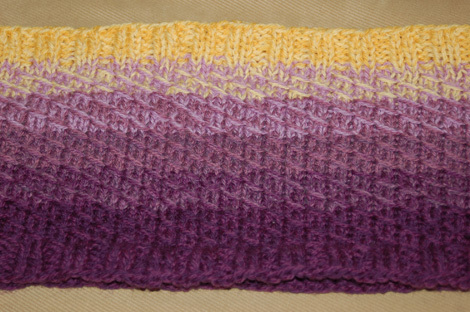 It was also my first experience with KnitPicks (Palette). It won't become my favorite yarn but it comes in tons of color and the price is definitely right! The many comments about this pattern curling are pretty much true. I steam blocked it with a good amount of success but it does want to curl if given the opportunity. What do you think? that is a very pretty scarf! Love, love, love the colors. Glad to see you back! looks gorgeous! welcome back to blog world. This page contains a single entry from the blog posted on November 10, 2010 9:37 PM. The previous post in this blog was It's My Turn!. The next post in this blog is Dino Dan.